Last night my daughter awoke with a fever. I immediately gave her a dose of children’s liquid acetaminophen. I put the bottle back in the latched chest on the top shelf in our locked hall closet. This is where we keep all medications—well out of reach. I left a bottle of ibuprofen on the bathroom counter ready for the morning. We alternate between Tylenol and Advil so we can safely overlap doses. I figured if I left the bottle out, there would be no hazy sleep-deprived confusion about which type to give her next. Smart right? Not really. In the morning as usual, Avery got up and went to the bathroom. I was two minutes behind her. When I caught up with her, she was standing on her step stool, holding the OPEN medicine bottle, smacking her lips. Half of the sickly sweet contents of the once full bottle were gone. I couldn’t believe what I was seeing. The bottle had a childproof lid on it! Turns out there is no such thing as a childproof cap. There are only “child-resistant” caps. “Did you drink a little or a lot?” I asked her trying to remain calm. “Um, a lot,” she replied. I smelled her breath in an attempt to determine how much she ingested versus how much was spilled on the counter. Then I promptly called Poison Control, hands shaking, kicking myself for leaving the bottle out in the first place. They informed me that Avery would have had to swallow 160 ml to reach toxic levels. The entire bottle was only 120ml and she had maybe half of that at most. She was fine. I was told to watch for excessive vomiting over the next four hours. Other than that, we were to carry on as normal. It may be tough for adults to open medicine bottles, but just wait until you see how quickly many kids are able to do it. Watch this Today Show video to see for yourself. Many children’s vitamins and medicines taste and look like candy that young children can’t resist. The scary part is, they don’t comprehend the danger. My friend told me her in-laws often look after her kids, and they keep their vitamins and medicine out in the open. “They may as well keep their meds in a candy dish!” she said. Advise family members who look after your children, in their home, to either move bottles to a safe location or to lock the drawer or cupboard. *I didn’t actually have a Bret Michaels poster. Artistic license people. 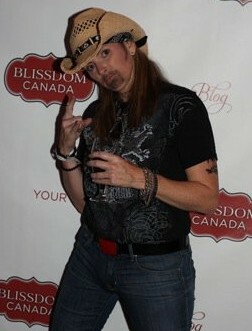 Mind you, my friend Dee dressed up as Bret for Halloween last year and he/she was pretty hot.